Think for a moment about the abuse your wood deck takes on a regular basis. Over time, constant exposure to the elements can wreak havoc on this space. 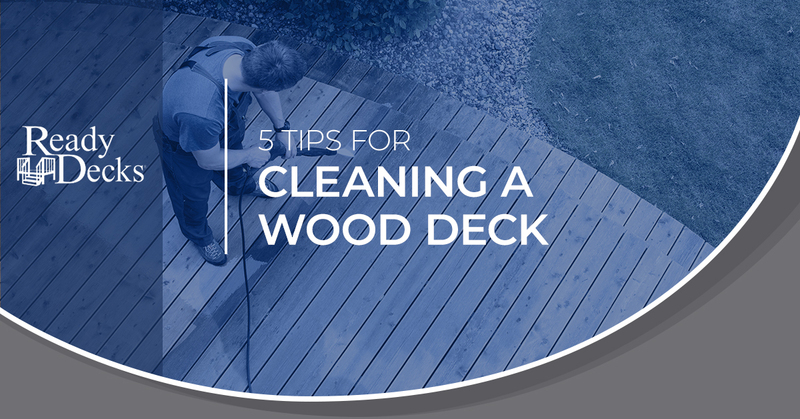 So what’s the best way to go about cleaning and maintaining your wood deck? If your deck is fairly small in size, you may consider cleaning it by hand. Just scrub the surface using a firm brush and a solution of oxygen bleach. You should expect to spend several hours cleaning your deck in this fashion. Needless to say, this process is also labor-intensive. This is by far the easiest way to go about cleaning your wood deck. Not only is pressure washing effective, but it requires a fraction of the time and energy compared to scrubbing by hand. If you don’t own a pressure washer, your best bet may be to rent one from your local home improvement store. Many homeowners mistake a pressure washer for just another garden hose or something similar. Keep in mind that improper use of your pressure washer could actually damage your deck. So read the instructions ahead of time and double-check with a professional that you are, in fact, using it correctly. You will need to fill the reservoir with a deck-specific detergent and then connect your garden hose to the attachment on the back of the machine. If you use too powerful of a spray, the deck’s surface could be impacted. We are often asked which nozzle provides the most effective spray without harming the wood. From what our contractors have seen, you should opt for a 25-degree to 40-degree nozzle. Once you turn on the washer and begin distributing the liquid along the deck, be sure to always follow the direction of the grain. Lastly, keep the nozzle at least six inches away from the surface at all times. Though this step seems obvious, some homeowners completely forget about it. Note that your deck will take about two days to dry, so hold off on moving furniture and other objects back onto the surface until that time has passed. Still see a few remaining stains even after pressure washing? Try spot-cleaning them by soaking the spots in oxygen bleach and scrubbing them with a firm brush. It could be that you’re wanting a new deck altogether. If that’s the case, Ready Decks has you covered. For nearly two decades, homeowners in the South have relied on our professionals for beautiful, functional decks at a price that won’t break the bank. See for yourself why Ready Decks is considered the number one deck installer in the region.